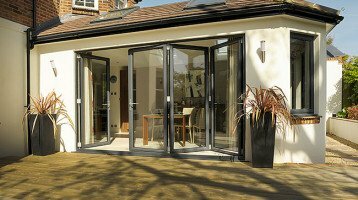 Bifolding doors are the must have product of today enabling you to create flexible spaces, add versatility to your home and bring your garden in. Whether as a replacement to your existing patio doors or sliding doors for an extension, they will transform your home and the way you live letting you relax in stunning open plan living areas enjoying wide aspect views. 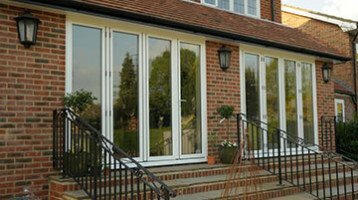 Cheam Windows use the Origin Bifolding Door. Acknowledged as the finest door available today and manufactured in many styles and configurations, they will open up your home and change the way you live. Safety and security as well as colours and designs around you are just some of the things that make Cheam Windows different. Cheam bifolding Doors in Surrey offer a host of unique features including industry leading guarantee and maximum security. A typical modern orangery or glazed extension with bifolding doors, provides all year round living space to your home. Sliding folding doors from Cheam Windows are cleverly designed, beautifully made and exquisitely finished featuring many unique innovations. As standard our doors have style, elegance and benefit from the very latest in high performance and high security with multi point locking systems also as standard. It remains one of the few bifolding doors conforming to the demanding, police preferred ‘Secured by Design’ standard. Cheam doors will feature smooth operation, combined with exceptional weather performance due to its excellent compression. Our door offers the deepest engagement of any shoot bolt locking system available on the market today. Furthermore, solid Yale security handles, high performing fixing bolts and British Standard security cylinders will give you peace of mind away from home. It is proven to protect against snapping, picking, drilling and bumping, offers a proven defence that is second to none. Our unique vertical locking shoot bolt solution completes the full quota of impressive security features. While a Stainless steel faceplate and a twenty year manufacturer’s warranty ensures durability and resistance against all the elements. These double bifolding doors feature white aluminium outside, wood effect aluminium on the inside. 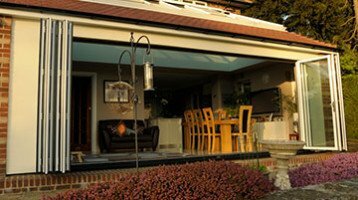 Our stunning doors and windows can help you create that perfect extension. 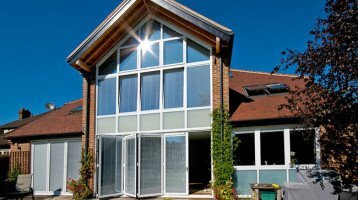 If you’ve not yet looked at the advantages of aluminium windows and how they can transform your home, we can help with our superb range of windows, doors, conservatories, bifolding doors and even sash windows in aluminium. Bifolding door hinges are often overlooked by others as a security weak point. Our doors again innovate, in being designed to withstand attack and offer little opportunity for even the most determined intruder. The strength and integrity of the door profile itself is also a crucial. Ours performs to the highest security standards yet is slim, strong and beautiful allowing maximum light. 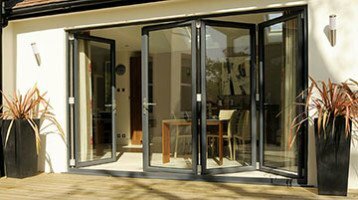 Our aluminium bifolding doors are a truly highly engineered product but can only perform if installed correctly. Our trained quality installers have all the knowledge required to install your new bifolding doors efficiently and correctly to ensure it performs in all weather for many years to come and with maximum safety and security.